This sweet tender glazed carrots recipe gets a boost from my favorite ingredient of all time: brown butter. 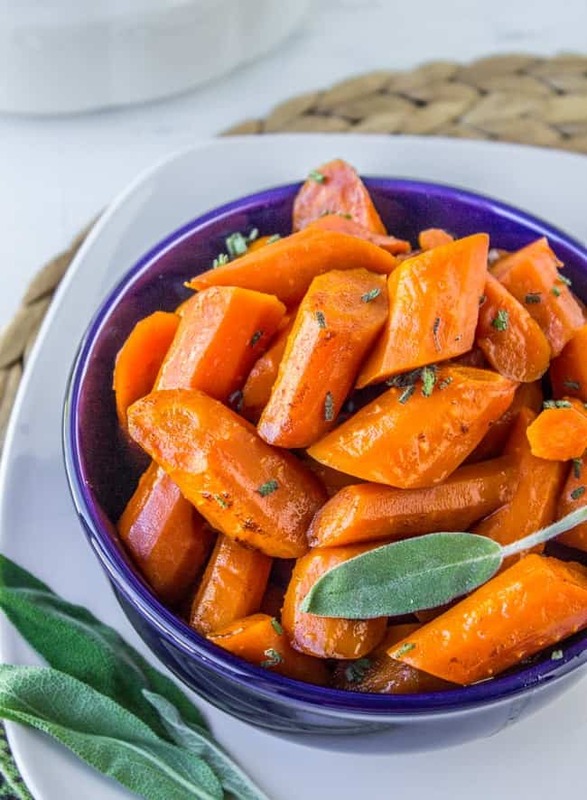 An additional secret ingredient that you might not guess puts the flavor of these slow cooker carrots over the top! 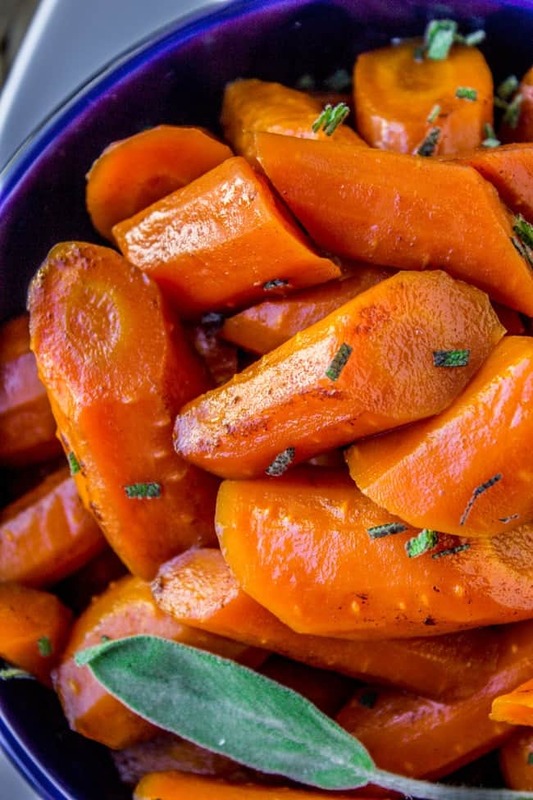 A perfect (and EASY) side dish for Thanksgiving or Christmas! I comforted him with the fact that Charlotte currently thinks “tasty” means “spicy.” I did not remind him that Charlotte is 4. So how was Halloween for you guys?? 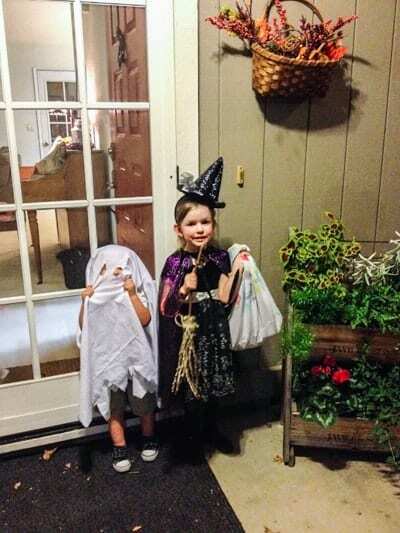 Ours was great, Charlotte was a witch and Truman was a ghost. Well, he was supposed to be. That costume lasted about 3 seconds. I was tempted to be frustrated, but then I thought about going through an entire evening with a sheet all up in my face. Uh yeah, that would last about 3 seconds. Way to stick it to the man, Truman. But Halloween is so last season. It’s time for THANKSGIVING you guys!!! A holiday all about food. And being thankful I guess. But also food. 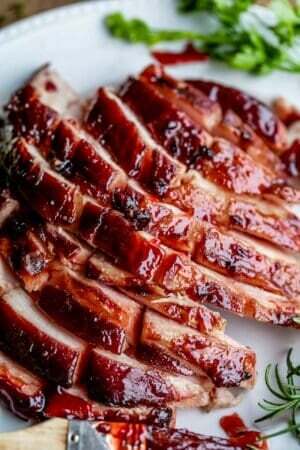 And speaking of tasty savory food, I’ve got the best Thanksgiving side dish for you today. 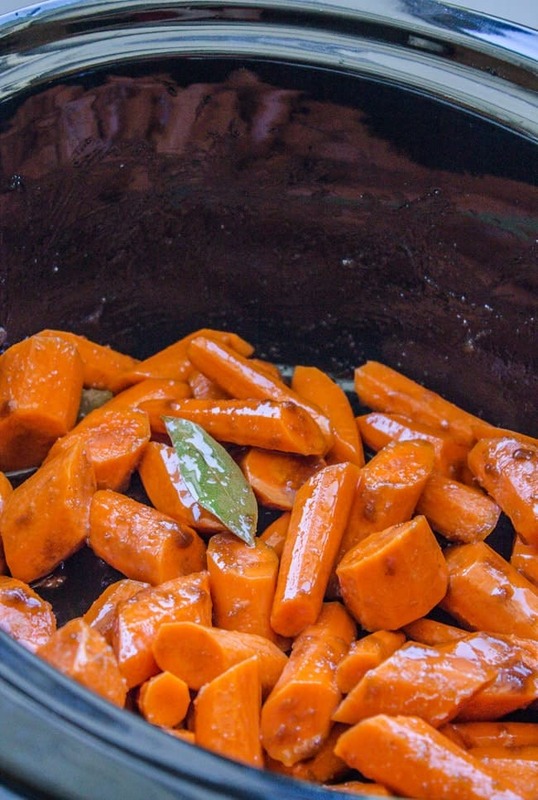 Who doesn’t love brown butter and glazed carrots, and these babies are made in the slow cooker. Win! I promised a secret ingredient and here it is: Nielsen-Massey Mexican Pure Vanilla Extract. WHOA, calm down, I know this is a savory recipe, and vanilla is usually in cookies and stuff, but I swear guys, it’s tasty (not spicy). I grew up putting Mexican Vanilla in everything, but it is especially delicious with carrots. It makes them extra sweet. You’ve got to try it! This is the perfect recipe for holidays when you have a ton of other stuff in the oven. 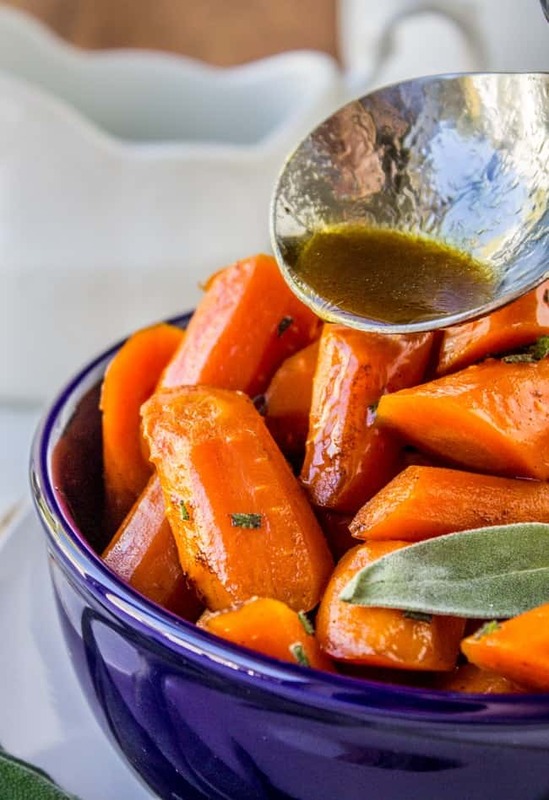 This sweet tender glazed carrots recipe gets a boost from brown butter. 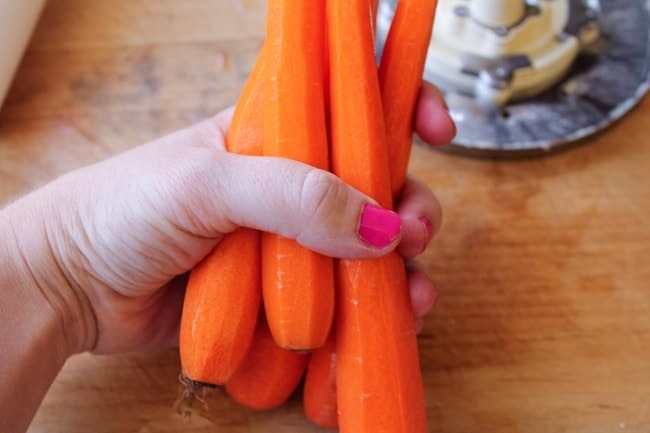 A secret ingredient puts these slow cooker carrots over the top! 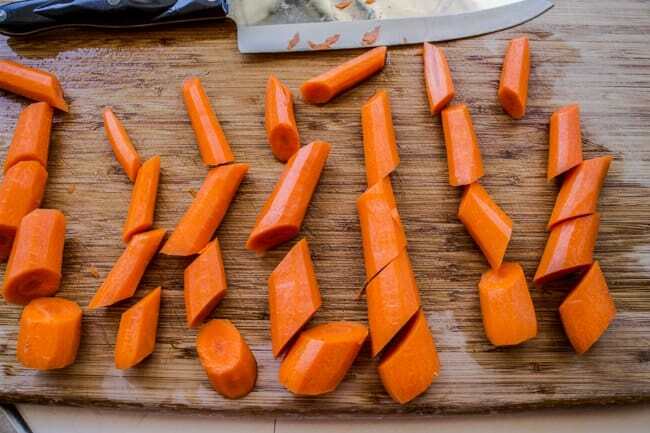 Peel and slice the carrots. I tend to like the thicker chunks of carrot, so don't go too crazy, just roughly chopped is fine. Set side. In a small saucepan add the butter. Turn the heat to medium or just above medium. Stir occasionally until the butter starts to foam and ultimately turns brown. There will be silty brown "bits" that have separated from the yellow liquid. Immediately transfer the mixture to your slow cooker. Add the salt, sugar, bay leaves, and vanilla and stir. Add the carrots and stir to coat. Cook on high for about 3 hours or until tender. Sprinkle with chopped parsley or sage. The glaze is really great drizzled over mashed potatoes too...just sayin. 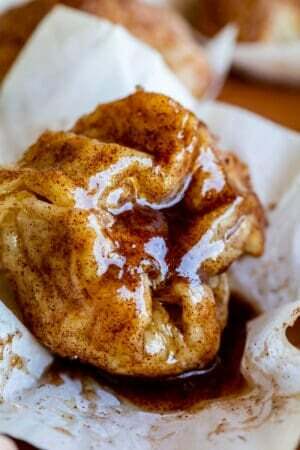 (I was compensated by Nielsen-Massey Vanillas for my time developing this recipe and post. All opinions are my own, of course!) Be sure to follow Nielsen-Massey on Facebook for tons of amazing ways to use vanilla! Try out these other great sides for your Thanksgiving menu! I have made these carrots for Easter for the past few years and they are always a hit! Delicious every single time. The family is bigger this year and I would like to double the recipe but I’m not sure if or how I should adjust the cooking time? Any suggestions would be helpful, thank you! 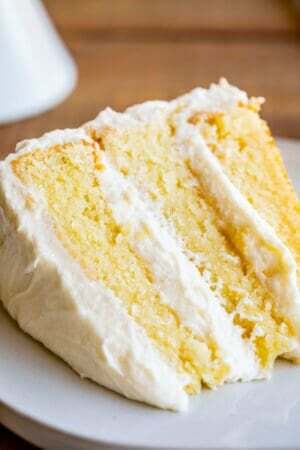 And thank you for the delicious recipe! Hey Sara! I actually don’t think you would need to change the cooking time. But I’m not sure because I haven’t tried it. Here’s what I would do: make them several hours in advance and check on them. then just keep them on the keep warm setting until you are ready to serve! I’m so glad you like the recipe, thank you so much for leaving a review! I’m so glad you liked it Maryanne, thanks for your review! 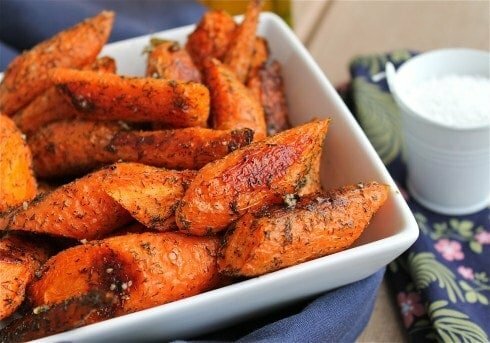 Have you ever tried these with baby carrots? I’m looking for the easy button this Christmas. Hey Mama! I haven’t but I’m sure it would work just fine! 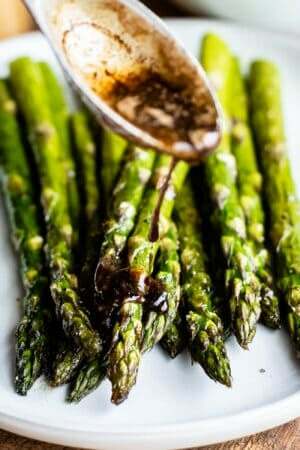 Can I make the brown butter the day before? Totally Jessica! It will harden in the fridge or at room temperature but that’s ok. You can just throw it in cold. I would go back a half hour later and stir once it’s melted. Could you do this with a medley of root vegetables? Sure Rosemary, I don’t see why not! I would maybe google some slow cooker times for whatever veggies you pick just to give you a ballpark idea for how long to let them go. Let me know what you try out! Enjoy! Hooray! Glad they turned out Lady! Thanks for stopping by! I like the addition of the vanilla. Yum! Thanks Laura! It really amps up the flavor! I love it. Hello! 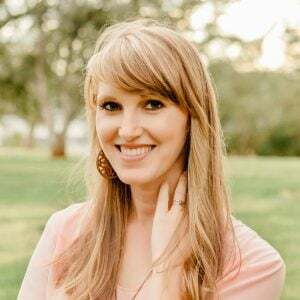 So glad I stumbled upon your blog today! These look DELICIOUS. I have a ton of baby carrots that I need to use up too. I feel like I’m still suffering from sugar hangover and it’s been a week, haha! I need to counteract with some vegetables :) Thanks for stopping by Liz! So. . . Eric isn’t too far off. I had to look this up. I wasn’t totally sure of the definition myself! Well, Karen, these carrots are going on the Thanksgiving menu. So, now with the make ahead gravy, the potatoes in the crock-pot and another crockpot of carrots what am I going to do all day on Thanksgiving? BTW your flower box looks amazing! And alive!! You are the best Kris!! Thanks for the official definition! Now I will be labeling all of my savory appetizers “Agreeably Pungent Bites” this year. lol!! Umm, soo….. Now Eric and Charlotte have got me thinking. I don’t think I know the true definition of savory either! Unless savory = the opposite of sweet, in which case… I’ve got that down. (But I still think Charlotte’s definition is adorable!) And I never would’ve thought to put vanilla in a savory dish, especially carrots! Brilliant, Karen!! Yeah, I like Charlotte’s definition too :) She’s so cute. And I always thought that savory just meant the opposite of sweet?? Maybe I shouldn’t be making fun of people until I look it up…haha! Thanks Ashley!! I’m sure it’s very confusing to be a 4 year old, haha! And yes, brown butter + vanilla = WIN! 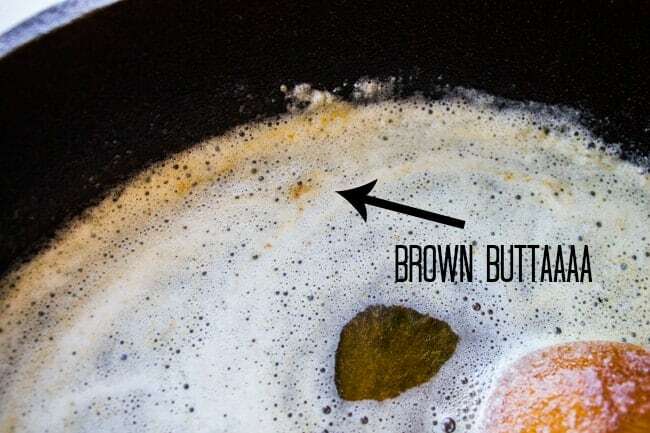 You had my attention at “brown butter.” It makes everything wonderful. This looks like a perfect Thanksgiving side. YES! the slow cooker is my BFF too! :) And yeah, Truman learned from the best. Isn’t it funny how quickly we switch our focus to Thanksgiving? 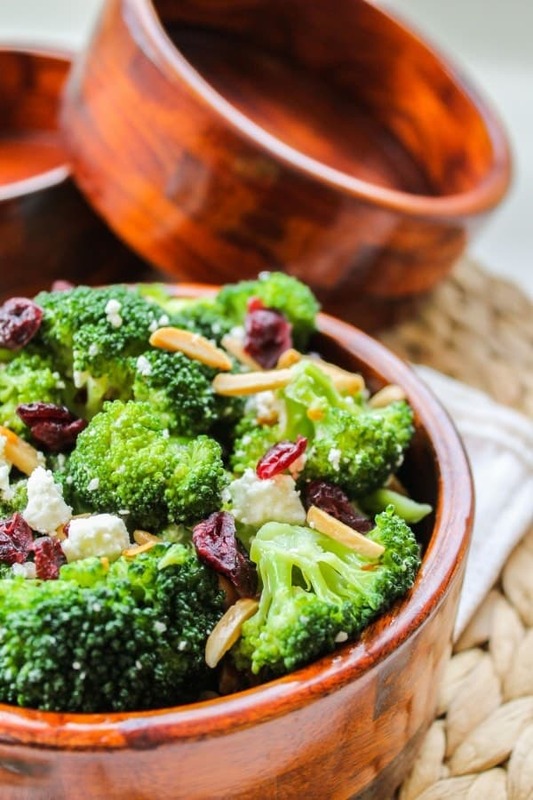 This looks like an easy peasy side dish for the big day! 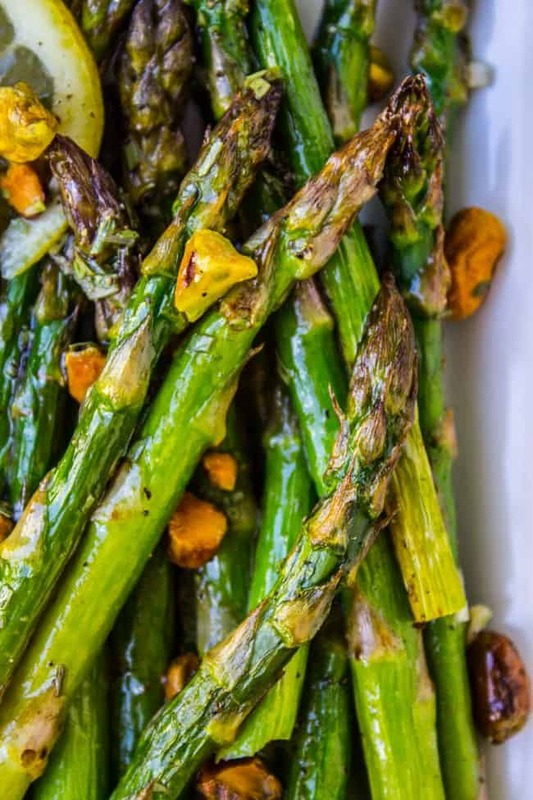 I’ve never seen a veggie side dish look so good but also use vanilla- I can imagine how delicious the flavor boost would be! Thanks Arman! The vanilla is a total game changer! I’m in love!